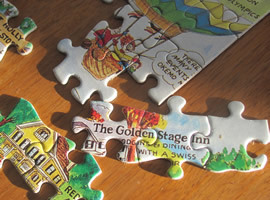 Golden Stage Inn offers premier Vermont bed and breakfast lodging. To assure your satisfaction and comfort, please take note of our rates and inn policies. Our Room Comparison Chart lets you quickly determine which room is perfect for your needs, and discover our inn’s amenities offered to all guests. Luxury robes, hairdryer, complimentary Wi-Fi, and summertime central air conditioning are a part of every room’s amenities. Also, our two course ‘from scratch’ breakfast, bottomless cookie jar, coffees, teas, Saturday Night Chocolate Cake, winter soups, and summertime honey lemonade are all standard for every guest’s stay. 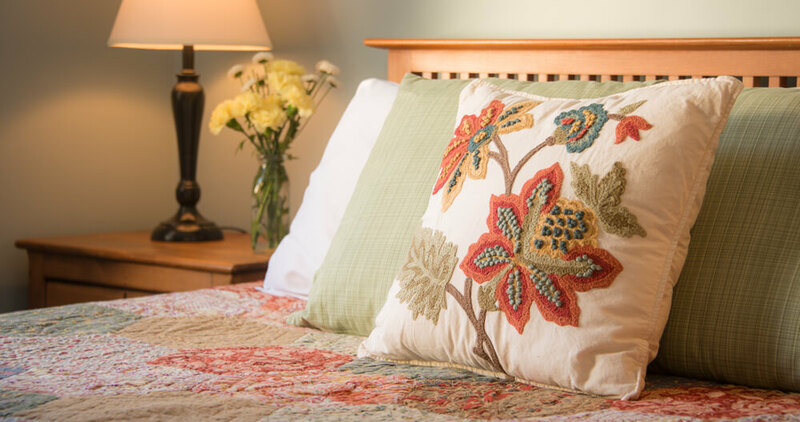 When you use our website’s Check Availability feature, the correct seasonal rate appears for each room. Or if you have flexibility with your dates, read the information below to find the best value for your travel. We have three rate periods: Standard, High Peak, and Off Peak. High Peak requires two-night minimum stays and occurs on winter holiday weeks and foliage weekends from mid September to mid October. Demand is high, so book early! Standard rates apply to the entire summer, foliage weekdays, and non-holiday winter weekends. Our typical standard room costs 189 at this time. Those with fireplaces or the family suites will be higher. “Old Stage” is a bit smaller and has only a full sized bed, so it will cost a bit less. Full breakfast and afternoon goodies are always included. Off Peak rates are when you can get the best savings! April, November and midweek winter days … check our website or get in touch with us for the best rates available. 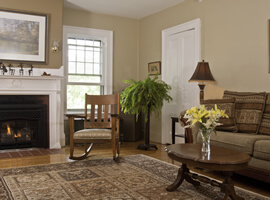 A required 9% Vermont Rooms Tax is added to each total rate. We never add service charges or gratuities. *Beehive Suite add $25 for 5th person. **For bed configuration, please specify when booking. Rates: Vermont Rooms Tax of nine percent is added to all rates. We never add service fees or gratuities to your bill. Reservation Deposit: A one-night’s fee deposit is automatically charged to your credit card at the time of reservation. Your balance may be paid by credit card, cash or check when you arrive at the Inn. Cancellations: Cancellations made more than 14 days prior to your scheduled arrival date result in a refund of your deposit, less a $25 cancellation fee. Cancellations made within two weeks of your scheduled arrival date will result in forfeiture of your entire deposit. Check-In/ Check-Out: Check-in time is between 3:00 p.m. – 9:00 p.m. and check-out time is by 11:00 a.m. Please plan your travels accordingly and speak to the Innkeepers in advance if further flexibility is needed. Children: of all ages are welcome but should never be left unattended at any time. Children over the age of 2 must be counted in the head-count for maximum room occupancy. The “extra person” fee of $25 applies. Note: we do have one Pack-n-Play available by reservation. Smoking: Smoking is prohibited inside the Inn. Smokers are required to use the front porch throughout the winter or the front lawn throughout the summer to fill their smoking needs. Please dispose of your waste responsibly. Pets: We ask that you leave your pets at home when you visit. The resident dog, Nelly, is allowed in the Inn’s common rooms, but never in the guest rooms. Discounts: While we do not offer specialized discounts of any kind (including Senior, Military and AAA), we do frequently offer mid-week and off-season specials. Check out our Vermont Inn Packages, sign up for our newsletter, or like us on Facebook to learn of these discounted rates. Discounted access to Castle Hill Spa and Retreat’s fitness center with an outdoor heated pool and hot tub, just a two minute drive from Golden Stage Inn. Also: discounts to Weston Playhouse, Okemo and cross country skiing, and various shopping/dining coupons. Mike’s signature “Saturday Night Chocolate Cake” on, well, Saturday nights!